“You have to give it a long time,” said my traveling companion, Alix. 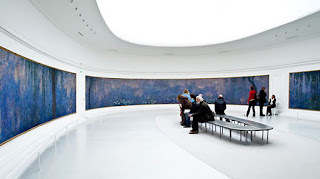 We were in Paris, perched before Monet in the Musee de l’Orangerie at the Jardin de Tuileries. The Orangerie's twin oval showrooms display Claude Monet’s massive Water Lily panels (Les Nymphéas), four in each room with a long viewing seat in the center. They are huge, each painting measuring about seven feet high and 42 feet wide; it’s a surround-sound visual extravaganza. I was burned out and tired from viewing art most of the day. We had gotten up early, breaking fast with croissant and cappuccino at the Café Voltaire on the Seine, then given most of our time and energy to the Impressionist masters at the Musee d’Orsay – the most beautiful museum in Paris, in my opinion. 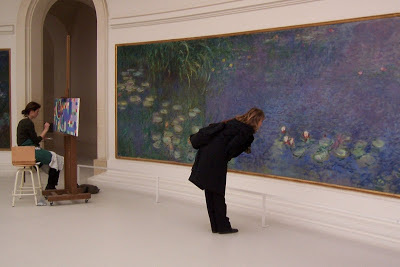 It was late afternoon by the time we got to the Orangerie to dive into Monet’s water lily masterpieces, and honestly, I was feeling less than inspired. My feet hurt, and I knew Alix’s must have ached, too. 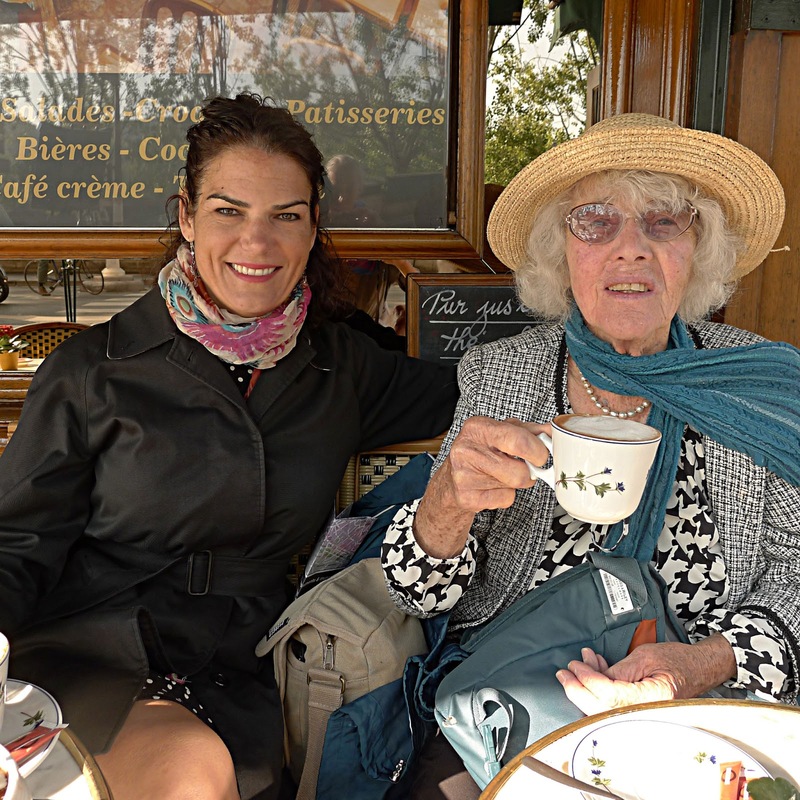 She was doing amazing for 85 years of age, determined to spend time with the Great Ones of the French Salon. I mustered my final hours of art-viewing energy for Monet, yet my eyes glazed over as I struggled to find the oomph in the oil and canvas. 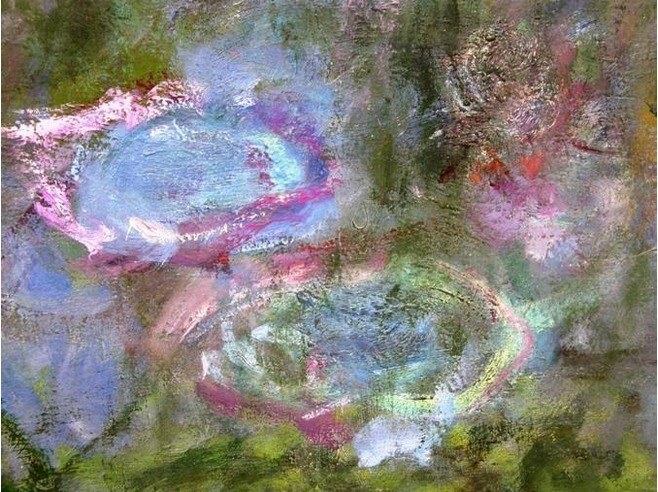 I began to see a blur of violets, greens, and pinks rather than any coherent beauty. Uh-oh, I thought. I've hit the Parisian point of diminishing returns. Art-intake threshold reached! I had not only reached saturation point: I had been desensitized. Darling Monet, Monet, Monet has been marketed into money, money, money. We see his work everywhere: advertising, coasters for cups, coffee mugs, calendars, pens, greeting cards, bathroom art and shower curtains. Dear old Claude’s ingeniousness is a victim of overexposure. But my visit to l’Orangerie taught me that just because something is seen seemingly too much or too often, it still holds incredible, innate value. You just may have to look much closer, and more carefully. Everything we see and experience is perception and subjective. We are the eternal subject. How does this apply to everyday existence? If we don’t like the way our life looks to us, we can try backing off a bit and looking from a greater distance, or we can zoom in closer. We may begin to see that there is a deeper rightness of fit, a resonant harmony to the placement pattern of each swath and swirl. We come to understand the underlying beauty of the situation, and how it all fits together, with sometimes extraordinary complexity. A seemingly haphazard concoction of events reveals a masterpiece. Let depth and subtlety speak to the soul. Like contemplating an overexposed Monet masterpiece, we can ask ourselves: have we reached a point where an objet d’affection is lacking luster, or failing to inspire? Have we fallen out of love with something or someone simply because we think we know it already? Look again, and look deeper. As my wise artist friend reminded me, sometimes we need to look for a long time.